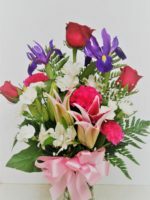 Stunning flowers such as roses, lilies, alstroemeria and mums are added to the beautiful Birds of Paradise to create this beautiful arrangement. What is a Beauty with Birds? 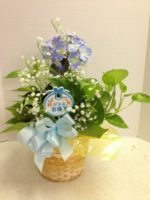 By now, if you’ve been perusing our website, you know “Birds” refers to Birds of Paradise, stunning tropical flowers that we have flown in directly from Hawaii. 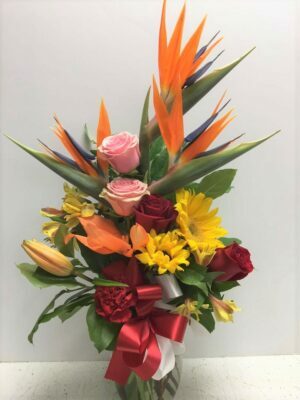 The unusually beautiful shape and brilliant colors of Birds of Paradise have made these flowers not just a designer’s favorite, but also a popular symbol of paradise. Here are some other options that Pamela designs with Birds of Paradise. Striking Sensational Orange, or Birds a-la-Pamela. This is a Roadrunner exclusive! 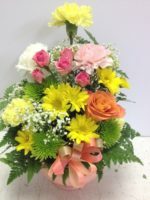 We are happy to deliver this stunning arrangement in greater Phoenix for you.